Rivers (ankle) is missing the start of the Chargers' voluntary offseason program to take an Easter vacation with his family, Eric D. Williams of ESPN.com reports. General manager Tom Telesco said the Chargers want to discuss a contract extension with Rivers (ankle), Eric D. Williams of ESPN.com reports. Rivers won't play in the Pro Bowl "due to injury," Sam Fortier of The Athletic reports. Rivers completed 25 of 51 passes for 331 yards, three touchdowns and an interception, along with a two-point conversion. in Sunday's 41-28 divisional-round loss to New England. 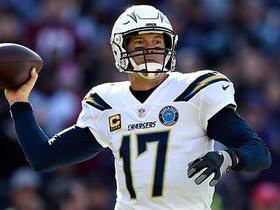 Rivers completed 22 of 32 passes for 160 yards with no touchdowns or interceptions in the Chargers' 23-17 wild-card win over the Ravens on Sunday. He also rushed three times for 15 yards and completed a two-point conversion pass to Mike Williams. Rivers completed 14 of 24 passing attempts for 176 yards, a touchdown and two interceptions in Sunday's 23-9 win over the Broncos. 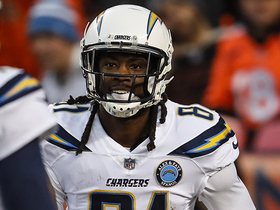 Analysis: Rivers found Mike Williams over the middle for a three-yard touchdown in the third quarter to give the Chargers a 14-3 advantage, which would be more than enough for the eventual victory. The 176 yards eclipsed the 37-year-old's season low from the previous week against the Ravens, to whom the Chargers lost at home. Now they will attempt to avenge that loss in Baltimore in the first round of the playoffs. Rivers completed 23 of 37 passes for 181 yards and two interceptions in the 22-10 loss to the Ravens on Saturday. Rivers completed 26 of 38 passes for 313 with two touchdowns and two interceptions in the Chargers' 29-28 win over the Chiefs on Thursday. He also threw a game-winning two-point conversion pass to Mike Williams with four seconds remaining. 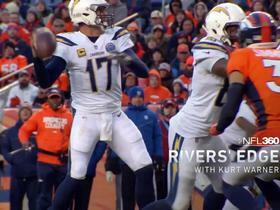 Rivers completed 19 of 29 passes for 220 yards and a touchdown in the 26-21 victory over the Bengals on Sunday. 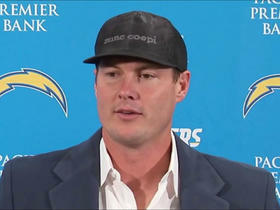 Rivers completed 26 of 36 pass attempts for 299 yards and a pair of touchdowns in Sunday's 33-30 win over the Steelers. Rivers completed 28 of 29 passes for 259 yards and three touchdowns in Sunday's 45-10 win over the Cardinals. He also fumbled once. Rivers completed 28 of 43 pass attempts for 401 yards, two touchdowns and two interceptions during Sunday's 23-22 win over the Broncos. Rivers completed 18 of 26 passing attempts for 223 yards, two touchdowns and one interception in Sunday's 20-6 win over the Raiders. He also had a 1-yard carry. Analysis: Rivers can thank Melvin Gordon for saving the day and breaking a 66-yard run after a catch in the flat in the third quarter, but the 36-year-old's fantasy owners will take it, however it comes. He hasn't failed to throw for fewer than 200 passing yards and two touchdowns in any game this season and continues to be one of the more reliable quarterbacks in fantasy. 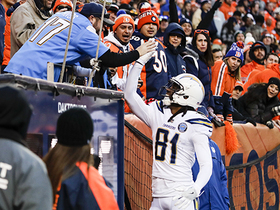 Rivers will try to keep it going at home Week 11 against Denver. Rivers completed 13 of 26 pass attempts for 228 yards and two touchdowns in Sunday's 25-17 win over the Seahawks. Analysis: Rivers had far from a perfect game. The veteran finished with a season-low completion percentage (50), but fantasy owners likely won't be too upset given Rivers tossed another two touchdowns, the ninth straight time he's pulled off the feat dating back to last season. The signal caller will likely have an easier time next week against a struggling Raiders defense that allowed 49ers third-string quarterback Nick Mullens to toss 250-plus yards and three touchdowns in Week 9. Rivers completed 19 of 26 pass attempts, for 306 yards and two touchdowns during Sunday's 20-19 win against Tennessee. Rivers completed 11 of 20 passes for 207 yards, two touchdowns and an interception in Sunday's 38-14 win over the Browns. Analysis: Cleveland's defense had done a good job against quarterbacks this season, but the Browns had no answer for Rivers in the first half. 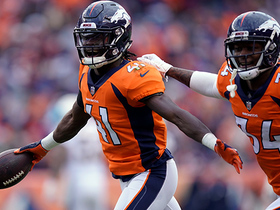 He hooked up with Tyrell Williams for touchdowns of 45 and 29 yards in the second quarter, but Los Angeles' lead got so bloated that Rivers didn't have to do anything of consequence after halftime and was even replaced by Geno Smith late. Rivers will face the Titans in Week 7. Rivers completed 22 of 27 passes for 339 yards and two touchdowns in the 26-10 victory over the Raiders on Sunday. Rivers completed 25 of 39 passing attempts for 250 yards, three touchdowns and one interception in Sunday's 29-27 win over the 49ers. Analysis: Rivers threw a pick-six on his second throw of the day, followed by the Chargers punting on their next two possessions, but the 36-year-old would then lead five straight scoring drives en route to the victory. The long-time Charger has now thrown for 250 yards and a trio of scores in all but one contest this season with a 226-yard, two-touchdown effort Week 3 being the lone exception. He'll look to keep rolling at home Week 5 against the Raiders. Rivers completed 18 of his 30 passes for 226 yards and two touchdowns in Sunday's 35-23 loss to the Rams. Rivers completed 23 of 27 passes for 256 yards and three touchdowns in Sunday's 31-20 victory versus the Bills. Analysis: The Chargers offense demonstrated remarkable balance Week 2, attempting 27 passes versus 26 runs. 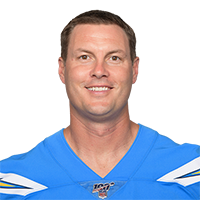 Rivers directed it admirably, posting the second-highest completion percentage in a given game (85.2) in his lengthy career. Moreover, he posted his 10th performance (in 194 starts) with three touchdowns, no interceptions and at least 9.5 yards per attempt. He'll upgrade opponents significantly Week 3, exchanging the dismal Bills for the rampaging Rams in Los Angeles Memorial Coliseum. Rivers completed 34 of 51 pass attempts for 424 yards with three touchdowns and an interception in Sunday's 38-28 loss to the Chiefs. Rivers completed five of seven passes for 29 yards during Saturday's preseason game against the Saints. Rivers likely will play most of the first half in Saturday's preseason game against the Saints, Jack Wang of the Los Angeles Daily News reports. Analysis: Coach Anthony Lynn plans to play most of his starters for the entire first half, but he said he might pull Rivers a little bit earlier. The 36-year-old quarterback appeared ready for the regular season in last week's exhibition against Seattle, completing six of seven passes for 62 yards. The loss of TE Hunter Henry (knee) still hurts, but Rivers has plenty of weapons at wide receiver and running back. Rivers completed six of seven passes for 62 yards in Saturday's 24-14 preseason win over the Seahawks. 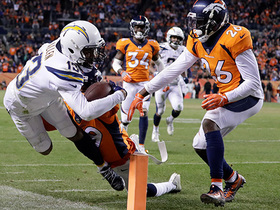 Analysis: Rivers played in the first two series, connecting with Tyrell Williams on the first play of the game for a 21-yard completion, the longest throw of the veteran quarterback's day. Rivers remains a strong fantasy asset and could even be a bit undervalued given how productive the Chargers offense figures to be this season. Rivers will play in Saturday's preseason contest against the Seahawks, Jack Wang of the Los Angeles Daily News reports. Analysis: Rivers did not participate in the team's first preseason game, as head coach Anthony Lynn opted to give the veteran quarterback some rest. It's unlikely Rivers will play more than a series or two against Seattle on Saturday. Rivers (rest) won't play in Saturday's preseason opener against the Cardinals, Kent Somers of The Arizona Republic reports. Analysis: Rivers will be joined by a number of other starters on the sidelines including star receiver Keenan Allen. In his absence, Geno Smith, Cardale Jones and Nic Shimonek will split the reps at quarterback. Rivers would support the signing of Antonio Gates, Eric D. Williams of ESPN.com reports. Chargers head coach Anthony Lynn said he wouldn't be surprised if Rivers were to continue playing into his 40s, SiriusXM NFL Radio on Twitter reports. Rivers completed 28 of 37 passes for 387 yards and three touchdowns in the 30-10 win over the Raiders on Sunday. Rivers completed 22 of 40 passes for 290 yards and a touchdown in Sunday's 14-7 win over the Jets. Rivers completed 20 of 36 pass attempts for 227 yards, one touchdown and three interceptions during Saturday's 30-13 loss to the Chiefs. Rivers completed 18 of 31 attempts for 319 yards and two touchdowns in Sunday's 30-13 victory over the Redskins. Analysis: Rivers came out red-hot Sunday, throwing for a career-high 256 yards in the first half. The veteran quarterback's two touchdowns came on an eight-yard completion to Hunter Henry and a 75-yard bomb to deep threat Tyrell Williams. The performance gives Rivers 1,097 yards, six touchdowns and zero interceptions over his last three outings. A date with the lowly Chiefs pass defense awaits Rivers in Week 15, when he will be one of the better options at quarterback in all fantasy formats. Rivers completed 31 of 44 attempts for 344 yards and a touchdown in the 19-10 win over the Browns on Sunday. Rivers completed 27 of 33 attempts for 434 yards and three touchdowns in the 28-6 win over the Cowboys on Thursday. Rivers completed 20 of 31 passes for 251 yards and two touchdowns during Sunday's 54-24 victory over the Bills. As expected, Rivers (concussion) is listed as active for Sunday's game against the Bills. Analysis: It's notable that fellow QB Cardale Jones is active for the first time this season, giving the team three signal-callers Sunday, but Eric Williams of ESPN.com relays that Rivers is expected to start the contest after being medically cleared to play this weekend. Rivers, who is listed as questionable for Sunday's game against the Bills, cleared the NFL's concussion protocol Friday, putting him in line to start for the Chargers in Week 11, Jack Wang of the Los Angeles Daily News reports. Analysis: Rivers was diagnosed with the head injury following the Week 10 overtime loss to the Jaguars, but given that he's been able to steer clear of concussions throughout his career, the Chargers were optimistic all along that he would be able to avoid an absence. With Rivers practicing fully Friday and an independent neurologist giving the quarterback the green light to make his 195th consecutive NFL start Sunday, Kellen Clemens will remain his familiar backup role. Rivers (concussion) is listed as questionable for Sunday's game against the Bills. Chargers head coach Anthony Lynn said that Rivers has yet to clear the concussion protocol and will remain a limited participant at Thursday's practice, Eric D. Williams of ESPN.com reports. "We think [Rivers will] play, but that's up to the doctors," Lynn said, regarding Rivers' availability for Sunday's game against the Bills. "That's not my decision." Rivers (concussion) will be limited at Wednesday's practice, Jack Wang of the Los Angeles Daily News reports. The Chargers have been encouraged by the progress Rivers has made through the NFL's concussion protocol and are hopeful the quarterback will be able to play Sunday against the Bills, Ian Rapoport of NFL Network reports. Rivers is in the NFL's concussion protocol. Analysis: It's early enough in the week for Rivers to move through the protocol, but Monday's news makes his status worth tracking as this weekend's game against the Bills approaches. Next up for the team's QB reps for any length of time Rivers is sidelined is Kellen Clemens, with Cardale Jones in line to serve as the Chargers' No. 2 signal-caller in that scenario. Rivers completed 21 of 37 passes for 235, two touchdowns and an interception in the 20-17 overtime loss to the Jaguars on Sunday. NFL Network's Peter Schrager explains why the biggest storyline of the Los Angeles Chargers-New England Patriots divisional game is quarterback Philip Rivers' quest for the Lombardi Trophy. Los Angeles Chargers quarterback Philip Rivers talks to the media following his team's win over the Baltimore Ravens in the AFC Wild Card Game. NFL Network's Kurt Warner sits down with Los Angeles Chargers quarterback Philip Rivers to discuss his career and making it to the 2018 postseason. 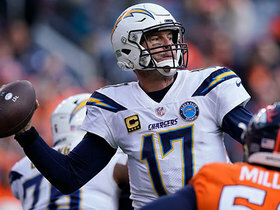 Los Angeles Chargers QB Philip Rivers makes a series of solid completions vs. the Denver Broncos in Week 17. 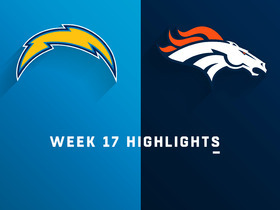 The Los Angeles Chargers faced off against the Denver Broncos in Week 17 of the 2018 NFL season. Los Angeles Chargers wide receiver Keenan Allen almost scores on a 21-yard catch. Los Angeles Chargers quarterback Philip Rivers finds his wide receiver Mike Williams for a first down on a tight-window throw. Los Angeles Chargers quarterback Philip Rivers darts a pass to his wide receiver Mike Williams for a 3-yard touchdown. Denver Broncos safety Will Parks intercepts Los Angeles Chargers quarterback Philip Rivers. 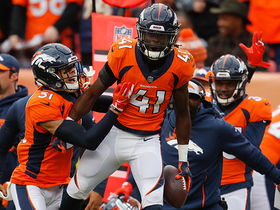 Denver Broncos cornerback Isaac Yiadom intercepts Los Angeles Chargers quarterback Philip Rivers.